Right now we’re in Russia. To be precise, in the middle of Siberia – right here! A very interesting country with rich history and strange rules (or absence of the latter). To our greatest pleasure, in Russia we discovered some fantastic local nail polish brands and also specialised nail art shops. Unfortunately, most of them don’t sell online and unless someone can recommend them to you or direct you to the location, it is impossible to find them. We were lucky – our friend took us to one of the largest nail art supplies shops in Siberia. Jeeezzz, we haven’t seen anything like THAT in Australia! Dozens of shelves full of various little pretty things – stickers, brushes, glitters, crystals, feathers, paints, stencils – you name it! We were so excited to show you, guys that nail art paradise but… the director of the shop said it is prohibited to take photos in the shop (not even with iPhone for Instagram!) and refused to answer any questions. Told you! Strange rules. Anyways, you can see part of our haul from that secret KGB nail shop here. 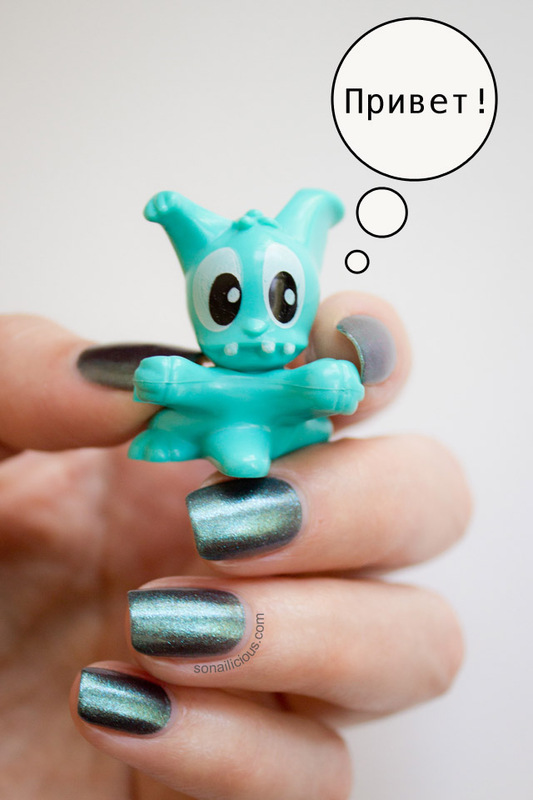 And, today we’re showing you one of the polishes acquired during our pilgrimage to that shop – Platinum Polish Emerald Duochrome! The shade is similar to Sally Hansen Lustre Shine Scarab but it’s darker with more blue undertones and glitter particles are slightly larger. Plus, quality of Platinum Artiste is better than Sally Hansen despite that Platinum nail polish costs less than SH (in Australia). 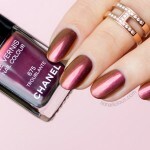 Curious to find out more about this shade? Read our full review below! Formula: Even though it is quite sheer, every new layer of Platinum Polish Emerald Duochrome goes on your nails smoothly. It is also fast drying and 3-free! Application: Very easy to apply. 4-5 coats will ensure full coverage. Finish: A complex metallic in greyish emerald shade with multi dimensional, extra fine glitter that ranges from turquoise, gold, lilac and red. It’s beautiful! 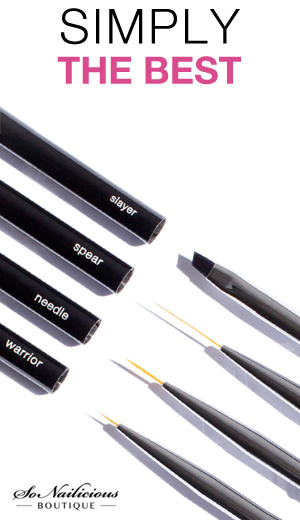 Brush: Great wide brush with nice bristles, very easy to use. Wearability: With top coat 3-4 days. Extra comments: Even though it is a glitter it is very easy to remove. Nail Art: Perfect as a base for any nail art or for glitter gradients. Not suitable for details as it’s too sheer. 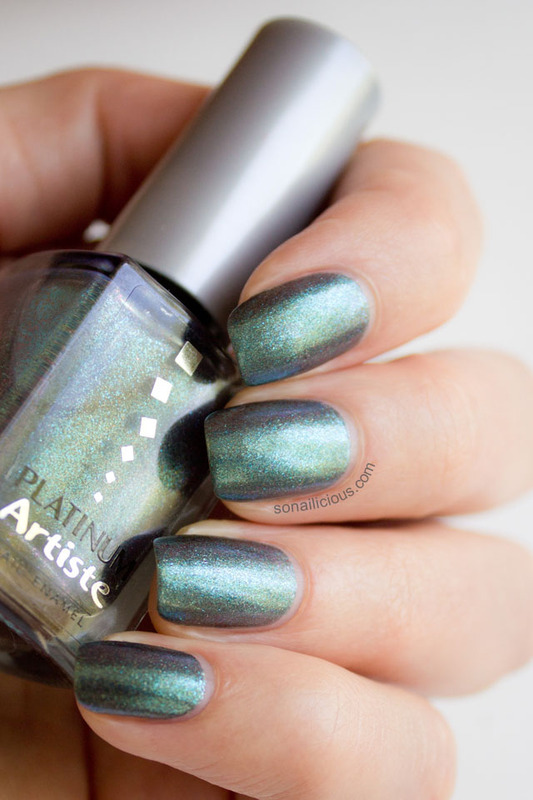 Overall Impression: A stunning emerald duochrome shade with a strong metallic effect! Fantastic quality despite the price. Not to mention it is 3-free. 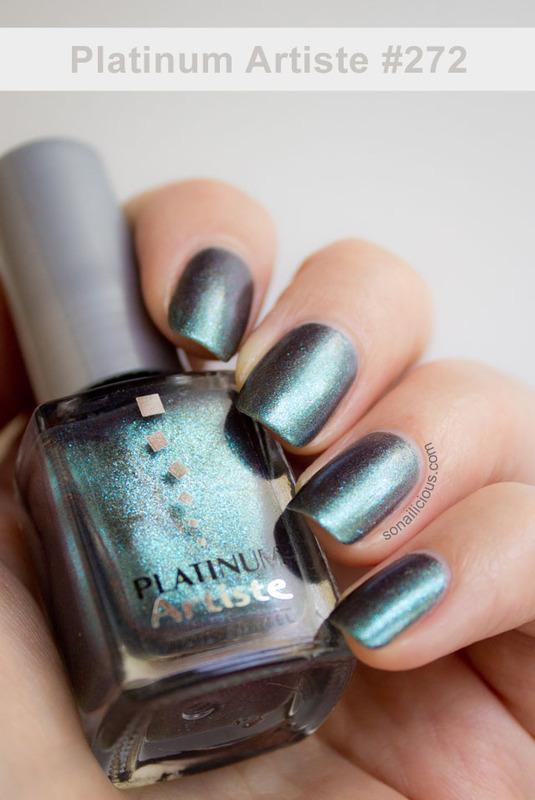 If you find Platinum Artiste polish, buy it without thinking twice! 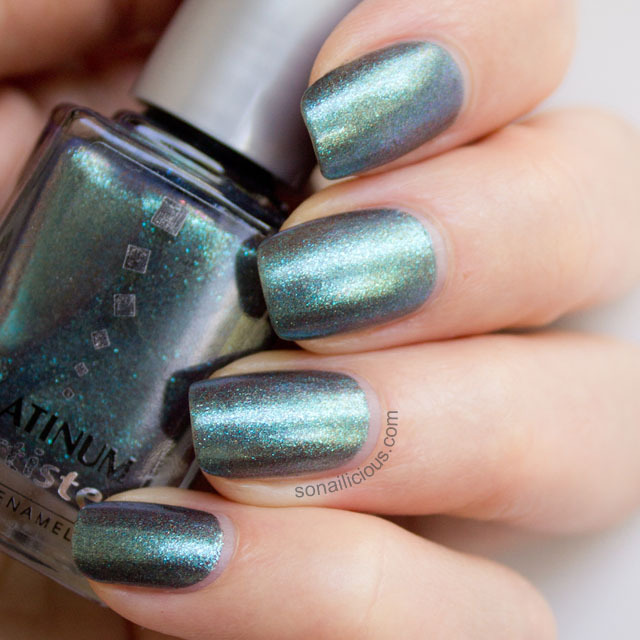 How do you like the Emerald Duochrome Platinum polish? Keen to get it? PS. Tomorrow we’re going into the wild Siberian forest called “Tayga”, so we won’t be online for 3-4 days. After that, Russia (or maybe Siberia) inspired nails with tutorial! 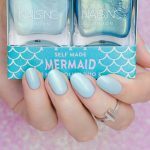 Check all our posts from SoNailicious Takes A Trip series here. Then stick around! 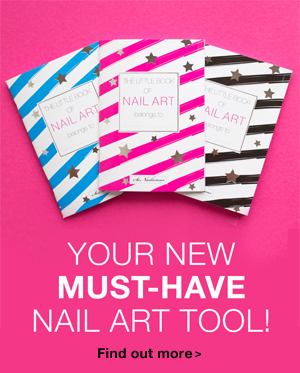 Subscribe to SoNailicious Newsletter to get our weekly email updates with the latest nail news.